The Iron Ladies are back! The members are now in their forties and are watching an exciting international volleyball match between Thailand and Japan. The ladies cannot bear to compare it with their Iron Ladies playing style. They are now recalling their glorious past. Coach Bee invited Mui to join Lampang team. However, Mui was hesitant to join the team because there were many members missing in the team. Jung and Parn volunteered to search and recruit the missing team members. After the team is complete, they undergo intensive training to get back in shape and consequently won the first place of Northern Thailand Volleyball Championship. Nevertheless, an unexpected incident happened after their victory and miserably scattered their team. Coach Bee and Mui started to gather their team back for an upcoming Thailand National Volleyball Championship. Will they pick themselves up and bring back their glory days? With the last instalment more than 12 years ago, the Iron Ladies are back for us to reminisce the era where transsexuals and transvestites were trending rather than pretty Korean boys and girls. I had mixed feelings about the Iron ladies Roar! film, so rather than going in circles, I thought I will just list out my three favourites parts and you can judge whether it’s worth the watch or not. Fans of Thai films, if not, fans of “Crazy Little Things Called Love” (สิ่งเล็กเล็ก ที่เรียกว่า…รัก) -think Mario Maurer, will know Sudarat Budtporm as the hilarious Teacher Inn. Here, she plays Coach Bee, who is a tomboy lesbian, bringing the group of Iron Ladies together to represent Lampang in the volleyball tournament, despite the organizers’ disapproval. Having her manly demeanour in contrast with the group of tall but feminine “ladies” brought the film plenty of slapstick humour. While most people will be amused, if not disgusted, by some of the less pleasant-looking transvestities, the one redeeming factor was the only “straight” eye candy in the team, Toast Arussaman Jittasiri (see guy in number 1 shirt). He did not have many lines in the film, but perhaps because of the relevance to my social circle, I was able to relate to him most. He had to reject his childhood friend, yet maintain a friendly distance, something that a few of my male friends had experienced before too. The wide variety of characters in the film can be considered both good and bad. The colourful ensemble brings out the different “types” of transgender, each with their personal problems but all working towards their common passion in volleyball. While their actions were over-dramatic most of the time, it isn’t easy to resist their unique charm and want to be part of this cohesive yet quarrelsome bunch. As this is a Thai film, the English/Chinese subtitles can either make or break the film. Somehow the weird subtitles made it difficult to understand some of their local jokes, which reduce the wit, humour and sentiment in numerous scenes. One of the jokes which was lost in translation was the “cow” joke, which I guess had the same pronunciation as some sexual actions/ body parts. While there’s no real need to understand the first two instalments’ plot to watch this, the multiple subplots also made the film pretty unfocused. The volleyball matches, which were supposed to be the climax did not excite me as much as I thought it would (the ear-piercing volume during the spats and competition whistles from the cinema made the matter worse) and it kind of end up with three words: Transgender; Volleyball, Drama-mama. Fans of Thai film (like me) should still watch it regardless, because the bold Thai humour is simply priceless. Iron Ladies Roar! is the third instalment of the Iron ladies series, with the first being “The Iron Ladies” (2000) and second “The Iron Ladies 2” (2003). It is made up of a different set of cast from the first two instalments. 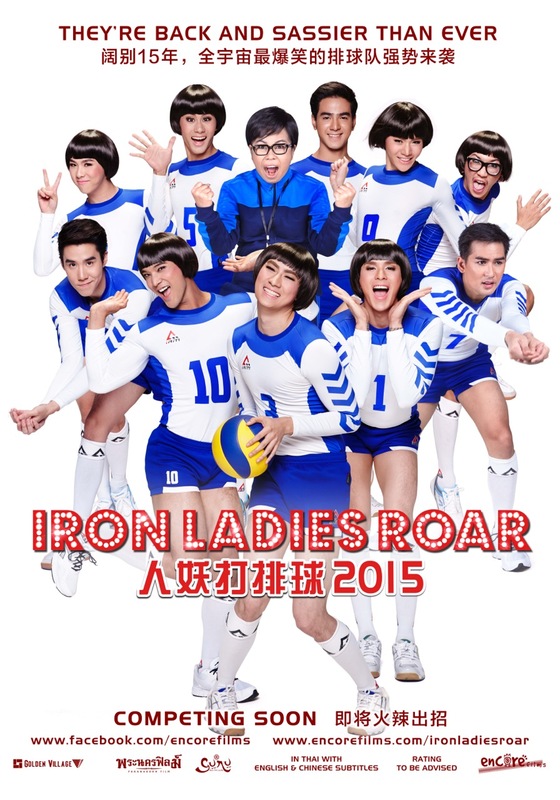 Check out Iron Ladies Roar! (人妖打排球 2015 ตัวอย่าง สตรีเหล็กตบโลกแตก)Facebook Page! Iron Ladies Roar! (人妖打排球 2015 ตัวอย่าง สตรีเหล็กตบโลกแตก) is out in cinemas on 9 April 2015. Finally could load the comment box! I remember the first two shows from secondary school days, hehe.. Gonna catch the third instalment if I can even if it’s only 3 stars.. I bet this movie is hilarious. The title itself makes me want to see it on the big screen. I don’t think so I have watched the previous two as well but reading your review and considering it a good laugh I feel like watching it. Actually the first poster itself is quite funny looking. not sure if my previous comment went thru or not, but I try commenting again.. Looks so funny just by looking at the poster..I guess it’s a funny movie worth everyone watching to have a good laugh inside.. This look and sound hilarious. Will try to catch it to have a good laugh with my family. 10 yrs apart of sequel film, omg! But its looks funny though. The poster alone tells me that I should watch this one but first I need to see the first 2 installments. It seems like a hilarious film. You don’t really have to catch the first two as they were 10 years apart and have no direct relevance! Looks like an interesting show with a interesting theme! Not quite my cup of tea though but thanks for sharing those humorous movie pr shots. the iron ladies series is till going strong huh! i’ve watched one of their first few movies and didn’t really like it, even though i like watching volleyball games. not my kind of humour….. This film is one hell of a funny flick. But I am new to seeing Thai films. That looks live movie with lots of fun and laugh.Nice one. Ooooh, looks like we’re in for a whole lot of laughs with this film! Would love to see it will my favorite gal pals who are up for a rib tickling experience! Iron Ladies Roar it is! Wow… never heard of this movie but my boyfriend said this is one of the popular movie of Thai, thanks for sharing. Never seen the movie before. I’m looking for it now. Hope to have some fun. Haven’t watched the first two Iron Ladies movies yet, but I think I’ll go ahead and try to, before watching this one. 🙂 Haven’t had the chance to watch a lot of Thai movies, especially comedies, but I’ve always been curious how they handle humor. Don’t think I’ve heard of this movie before but it does sound like it will be a very funny movie. Sounds like a fun movie. Their get ups look funny.